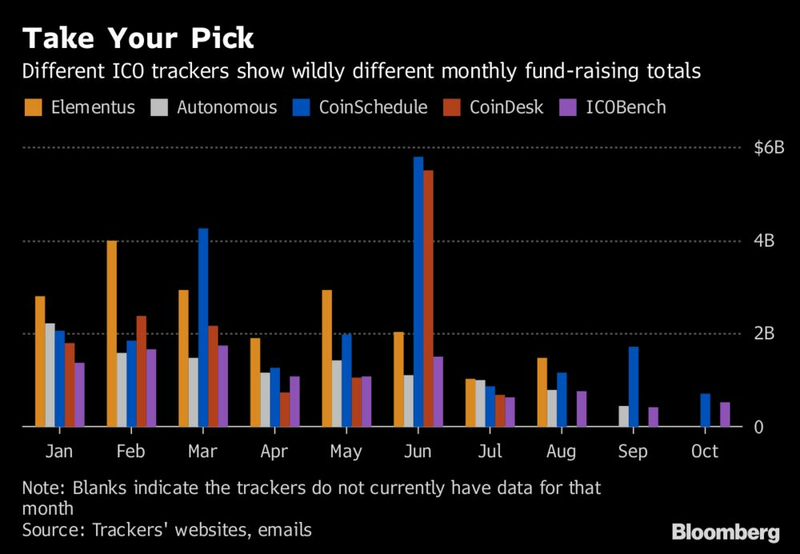 So far this year, initial coin offerings have raised $22 billion, or half of that -- depending on where you look. With the cryptocurrency market nearly 80 percent off its peak, a critical question is exactly how much the ICO boom has deflated. That becomes harder to answer when even the most commonly used websites that track the phenomenon disagree on the figures. Blockchain may be billed as an immutable public ledger, but in the controversial world of crypto it spawned, establishing truth can be tricky when disclosure standards are still being improvised daily. In the case of ICOs, it remains hard to ascertain the amount of funds a issuer claims it’s raised when no one has to submit any regulated filings or even reveal their identities. “At the end of the day, there’s no way to really agree on the information based on provable facts,” said Alex Buelau, co-founder of Oxford, U.K.-based listing site CoinSchedule. Most data trackers, which make money from charging token sellers for listings or other services, rely on issuers for information on the ICOs.Take Ruby-X, a crypto exchange project. CoinSchedule says it raised $1.2 billion; ICORating, $200 million; Autonomous Research says it’s chosen to exclude it, since its online footprint was unreliable. Ruby-X, which hasn’t disclosed where it’s based, didn’t reply to e-mails seeking comment. Or consider an even more extreme example: Venezuela’s sovereign Petro. In March, President Nicolas Maduro said it has garnered $5 billion in offers; in April, he said the sale raised $3.3 billion; the token’s website says $735 million, the figure cited by CoinSchedule and ICORating. Even with the best intentions, collecting basic facts about token sales can be a challenge. ICORatings combines information from issuers, investors and the blockchain itself. Elementus, a new startup, tracks data from the blockchain, supplemented with reported figures that it considers credible. With the ability to trace actual transactions, on-chain data are more reliable and comprehensive, which is why their fund-raising totals are higher, says Elementus co-founder Nuria Gutierrez Prunera. The downside is that on-chain data don’t capture investments in fiat currency. Autonomous Research goes through about 50 different underlying trackers to compile its ICO data and manually removes entries it considers untrustworthy, said Lex Sokolin, global director of fintech strategy. The trackers it depends on have varied over time as their quality can fluctuate, possibly because the economics of maintaining a database have weakened, he added.To complicate things further, the nature of ICOs is also evolving. A growing portion of tokens are offered privately to selected investors, rather than crowdfunded via the internet as the innovation was initially known for.Read More: Hedge Funds Flip ICOs, Leaving Other Investors Holding the Bag “It’s a lot more difficult to find out information about private sales,” said Sasha Kamshilov, co-founder of ICORating in St. Petersburg, Russia. 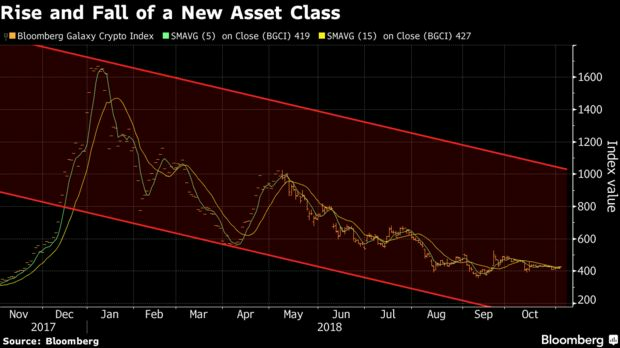 The Dragon token, which professes to offer a payment system for the entertainment industry, told Bloomberg News in August that it raised $12 million in a public round and $408 million in its private sale. For that sale, Elementus and CoinSchedule gave the $420 million total, ICORating had $3.9 million, whereas CoinDesk and Autonomous had $320 million.Telling the right story about crypto matters when debates over its future are raging amid the fading speculative frenzy. After Autonomous published a report that showed token offerings were down 90 percent from their monthly peak in September, it received criticisms that that month actually saw more than $1 billion of funds raised, rather than the $300 million it cited earlier. 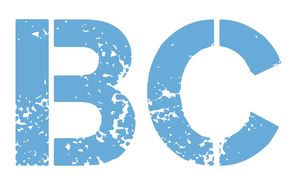 Francisco Gimeno - BC Analyst ICO' ecosystem is yet at its early period. It can wildly grow and then suddenly fall, while evolving in quality too. We are seeing ICOs looking for private sales before being public, and investors more critical on the White papers information. The info on the Web is not very reliable yet. Narratives and images show one thing, real facts usually lead to the opposite.